In December, the Polymer Clay Swaps group did a Fairy Door Swap. 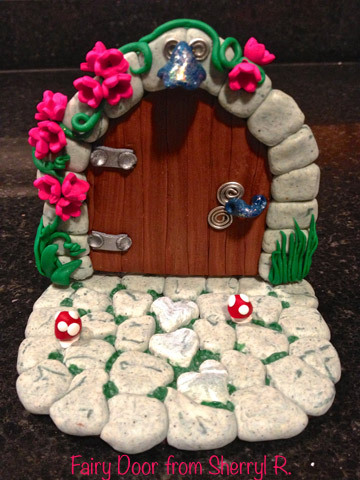 Fairy Doors are supposed to be portals that fairies come through when you're not looking (how cute is that?!?) I was paired with a lovely woman named Sherryl. You can view my door, above, with a tree growing around it, and you can view hers below, with all of the precious details. Did you notice the heart-shaped stepping stones? Fairy Door by Sherryl R.
I am involved in one more swap for February, which is texture sheets and hearts. That should be exciting. I'll post about it after my partner and I receive our pieces. 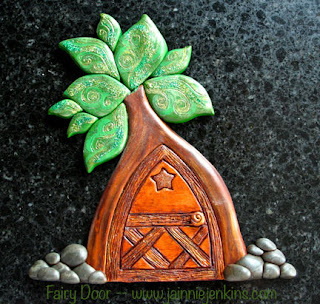 love the fairy doors - both very different but both lovely! Swaps are so much fun - must take part in one again soon.